London! This explains my recent blog-absence, I have been travelling back to Europe. Not just to London, but to France as well, where I did a great many sketches, most of which were in Strasbourg at the 2015 “Rencontre Nationale” of Urban Sketchers France – more on that fun later. But London, it’s always a pleasure to come home, and it’s always so brief. I came ba ck to surprise my dad for his birthday, which was fun, and we had a nice family get-together. On the second day, I went down into central London and took my mum to afternoon tea at Fortnum and Mason. It was pretty posh. 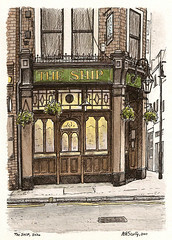 Afterwards though we popped into The Ship, my favourite pub on Wardour Street, where I did this sketch above. I have sketched outside The Ship before (see left), but this was my first interior. I always liked this pub’s unchanging, yellowy, old-fashioned interior, so was surprised to find that it has been ‘done up’. Not demolished and converted into a gourmet burger restaurant or luggage store like everywhere else, in fact the interior hasn’t really changed much at all, except it has been nicely repainted and cleaned up considerably. It is still very much The Ship, just smarter. 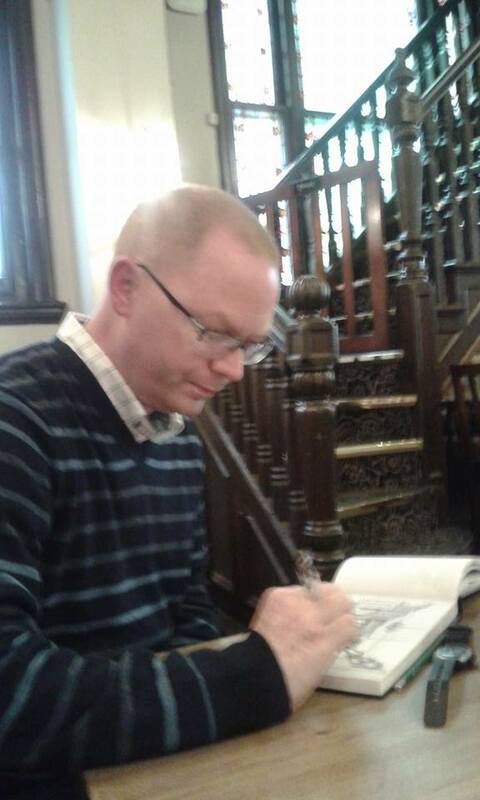 My mum took a picture of me sketching it, in case you wondered what I look like when I sketch a pub (what did you expect?). It was great to be back in London. 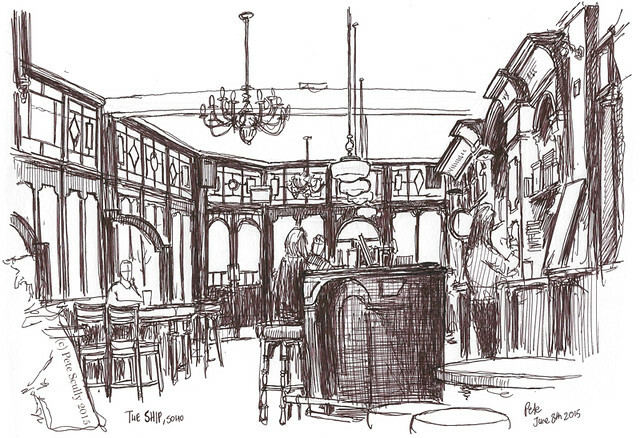 Looking forward to some more London pub sketches! I love your London sketches Pete. Ooooh, tea at F&M, posh but so worth it. I love their signature China colors and the lovely tearoom. Nice to treat your Mum to that. Next time I’ll take Ron to ‘The Ship’. Yeah, you’ll like the Ship. Mum loved Fortnum’s, it was very posh.